The collection of photos of the Navy Musicians Association reunion grows. Thanks to Max Murray for the lastest batch. Links to photos and videos are over on the right. Check 'em out, send me the URL for your collection and I'll include them. Coming soon: NMA big band videos. Thanks to all who took photos and shot video clips of the NMA reunion last month. They are a valuable reminder of the fraternity, camaraderie and music we MUs share. Send me links to your online work--videos at YouTube, photos at FlickR, wherever your stuff is hosted--and I'll post the links here at NavyLyres. For easy access, I'm putting all links in the sidebar to the right. Enjoy! I'll be away for a few days at the University of Iowa Summer Writing Festival. You don't think I come up with all this great stuff by myself, do you? Internet tips for finding old shipmates from bygone bands. Internet tips on hiding from old friends who are trying to find you. How I set the record for the shortest tour at the U.S. Navy Band. Now it can be told: The Steve Dimond Farewell Invitation Golf Tournament, 1984. "Pier Pressure": The Navy's first Fast Attack Combo. The Sins of Lee Hudson. Chapter One, Personality Defects. Fair winds until next week, shipmates. Waiting for the plane to take off from the Detroit airport, I found myself sitting among a flock of teenagers sporting iPods, nose rings, tattoos and a catalog of hairstyles that ranged from dreadlocks to green spikelets. A redheaded kid in the seat in front of me—I could only see his head—even sported a retro, 1950s crew cut. This was the last leg of my trip from Illinois to Norfolk, Virginia, for a reunion of the Navy Musicians Association. Former members and leaders of U.S. Navy bands, we gather once a year to play the old songs and tell the old stories. We speak of the Navy musicians who died at Pearl Harbor, listen to the tales of bandsmen who served in Vietnam and remember the work involved in entertaining troops on land and at sea, at play and at war. Naturally, our old-man talk sometimes drifts to the current culture in which age and wisdom no longer merit respect, and notoriety, youth and individuality are valued. Thinking of this, I began to smolder at these children seated around me to whom “sacrifice” is a word on spelling tests and “duty” is something you pay when going through customs. I fumed at a society that tolerates, even celebrates the whims of these kiddies, like the girl next to me who was, it appeared, traveling in her pajamas, and the rebel in front of me with his dopey crew cut. Burying my face in the in-flight magazine, I clenched my teeth in indignation. O sweet, cosmic justice. My age and bearing had identified me as a former military man, a valued citizen worthy of special recognition in this flying daycare center. Trying not to gloat, I reached to unfasten my seatbelt, ready to rise and accept this richly-deserved gift. As I fumbled with the buckle, the kid in front of me—the redheaded bozo with the crew cut—said, “Thank you,” and started to rise. What a presumptuous little brat, I thought, this twerp who would try to claim my respect, to usurp my position. What sort of low-class airline was this, anyway? The kid stood up and stepped into the aisle. The white of his bellbottom trousers and jumper was blinding, his neckerchief rolled, pressed and knotted to training-manual perfection. Dixie cup hat in hand, the young sailor followed the flight attendant up the aisle, through a sea of watchful youngsters who briefly interrupted their text messaging to offer smiles. If this were one of those e-mail stories that clog inboxes around patriotic holidays, the passengers would have stood up, applauded and sang “God Bless America.” The truth was much more impressive: an airline’s employees quietly recognized someone who merited special favor, a sailor graciously accepted a courtesy, and—most significantly--nobody found the incident particularly remarkable. Except a certain passenger who has a habit of judging entire generations and institutions a little too quickly. I've just been in Facebook contact with the guy responsible for me becoming a Navy musician. David Lewis and I were freshman together at Ithaca College, 1966-67. These were not years of widespread academic stability and accomplishment. We formed a guitar/bass duo and played "Eve of Destruction" and "Nashville Cats" for beer in the campus pub. Dave eventually joined the Navy and I transferred to another school. I ran into him in New York City in the late '60s; he had a job playing the French horn in the New London Navy Band, spare time in the city, money in his pocket and not too many complaints beyond haircuts. By 1974, I had become a college graduate with a worthless degree in Theater, a half-baked pianist and three-chord guitarist, substitute teaching English as a Foreign Language in Washington, D.C., a job for which my qualifications were the fact that I spoke English and my students didn't, a job I performed with the flair of a longshoreman, a job that combined the joy of root canal work with the job security of a pimp's assistant valet. The upshot of it all was a number of years in Navy music for which David Lewis is somewhat responsible. Now that I've found him, I'm not sure whether to send him a thank-you letter or spam him with hate mail. "Navy for Moms," a website that pretty much lives up to its name, has a subgroup called Moms of Navy Musicians at which the mothers of MUs log in to keep each other up to date on the doings of their darling little petty officers. I am not joking. MUs email their Moms about their latest liberty exploits, and the mothers discuss it online. I thank the Almighty that this technology didn't exist when I was in the Navy. Frank's Mom: Hi, MU Mama! Did your David survive Friday night at Rocks and Shoals with Frank? MU Mama: Yes. Little Davey says our two sailor boys poured Bud down their throats until they were so hammered they puked in their Corfram shoes and got thrown out for sticking IOU's in the stripper's thong. Frank's Mom: Was it Satana or Jezebel? MU Mama: Satana, I think, the one with the big you-know-whats. Frank's Mom: Makes you proud, doesn't it? We jam. We laugh. For four days we share stories of bad gigs, fair winds and good grandchildren. But the highlight of a Navy Musicians Association reunion comes on Saturday night: a Navy band files into the ballroom, the conductor gives the downbeat and a hundred or more former MUs rise and snap to attention at the playing of the song that, with every passing year, means a little more to us. U.S. Fleet Forces Band, 27JUN09, LCDR Kevin Bissell conducting. On Saturday, June 27, LCDR Kevin Bissell conducted the U.S. Fleet Forces Band at the closing dinner/dance of the Navy Musician Association's 2009 reunion. The band played Mr. Bissell's selection of American and British marches with the precision, balance and artistry we former Navy musicians have come to expect from today's young, professional MUs. We expect it, yet it always catches us by surprise. For me, that catch-in-the-throat moment came when Mr. Bissel cued a drum roll and the opening strains of the Carmen Dragon arrangement of "America, the Beautiful" filled the ballroom. This piece holds memories for many of us, and to hear it played with such fullness and resonance, not by a concert band or wind ensemble, but by a stand-up, fleet ceremonial band--a "bag band"--was, and is, inspiring. It's a talented and vigorous generation of MUs that has stepped into our shoes. You spend weeks, months, riding ships and buses, playing two, three shows a day with the same bunch of guys, sleeping next to them, eating with them, cursing them, smelling them, fighting with them. Some shows bring crowds of thousands to their feet; others barely attract the attention of a couple of streetwalkers and a guy with a push-broom. You think the punishment will never end, but eventually you get back home, run down the gangplank and take off on a hard-earned 48-hour liberty. Freed from close confinement with the idiot brigade, you hit the beach, reveling in your freedom until the town closes down and you go home to hit the rack. During the Saturday night dinner/dance, some bold members of the Fleet Forces band summoned up the courage to join us on the bandstand. First, a young MU took a spot in the trombone section, next a drummer climbed aboard and pretty soon half the NMA Big Band was sporting flashy crackerjacks and youthful enthusiam. "...to emphasize the importance of music in the Navy"
ADM Jonathan W. Greenert wanted a ticket to the Saturday Night Dinner/Dance of the 2009 reunion of the Navy Musicians Association. The admiral got his way, perhaps because we were playing in his backyard; he's the Commander of U.S. Fleet Forces Command, formerly known as the United States Atlantic Fleet. Admiral Greenert sees the Fleet Forces Ceremonial Band regularly; it is, after all, his band. Yet, I doubt he has ever seen the band greeted with greater appreciation than that shown by the Navy Musicians Association on Saturday night. The applause began as the first piccolo player entered the ballroom, grew to a roar as bandsmen followed in single file, and by the time the last tuba player came through the door, the ballroom was awash in a tidal wave of appreciation. It is not often that a Navy band earns a standing ovation before playing. In a few weeks, ADM Greenert will move to the position of Vice Chief of Naval Operations, a job in which he will deal with the perennial proposals to cut bands and reduce their funding. I can't help thinking that when such paperwork comes across his desk, he'll remember the Fleet Forces Band's stirring rendition of "Army of the Nile" and the wild applause that followed the closing chord. The mission of the Navy Musicians Association is, in part, "to emphasize the importance of music in the Navy." I'd say that by showing Admiral Greenert our appreciation of the professionalism and artistry of the Fleet Forces Band, we completed our mission. Although we'll never know, perhaps our efforts will, in some small way, help prod ADM Greenert to increase music program funding. 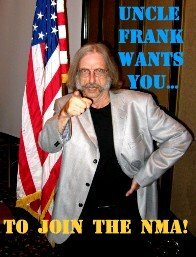 Who knows; maybe he'll even get the NMA some new stand lights and an electric piano with a functional middle "c."
The lounge and rehearsal spaces of the Holiday Inn were visited by quite a few MUs with video cameras last week. We want to see them. Especially videos. (Sure, we like photos, too. Go ahead, send me the URL to your online albums, and I'll link to it). But We Want Videos. Got a video from the NMA reunion on YouTube or similar video host? Send me the URL. Max Murray, for instance, sent me the embedded link to a YouTube clip of me demonstrating the one-chord guitar technique that got me where I am today, As a self-sacrificial Jesus-like exemplar of humility, I've linked to it a few posts below, so you can see the awesome results you'll get if you send me your video links. Put 'em up on any video hosting site--YouTube is a favorite--and tell me where they are. It's that simple.